Make snow tires for your bike with zip ties! Take that bike out of snow storage, people: the folks at Dutch Bike Co. have a handy way to give your two-wheeled ride some snow tires for cheap—all you need are zip ties! The Seattle-based bike experts were looking for a good alternative to pricey studded tires when they happened upon this genius substitution. Just snap the ties on your wheels, clip off the excess, and you’re ready to go zipping through the winter wonderland covering much of the Northern Hemisphere right now. The folks behind this genius discovery assure you that the zip ties will cut into snowy and icy surfaces enough to make sure you won’t go slip sliding away. *NOTE: This will only work for bikes that have disc brakes. If your bike has cantilever brakes, wrapping zip ties around the rims will cause severe damage. does this work with coaster brakes as in the kind of bike that allows braking by peddling backwards like on the old-time bikes from the '80's? Why not just set your tire pressure correctly? It seems like this would cause a bit of an issue with using the brakes unless you have fancy disk brakes... also they would definitely become brittle and break off. This seems like a terrible idea. wrap small rope or a heavy string around your tire in a similar manner. Do a spiral through the spokes and you only have to tie the ends together with one knot. It worked for motorcycles back in the day. These fall off too easily and break when the weather is under 20 degrees Fahrenheit. please note that these will not work with rim brakes. Awesome idea. But... aren't the twist ties a one time deal? Once you cut them off you'll have to discard the plastic which might last for a while in a land fill, then end up circulating in the ocean for a few hundred years before choking the last remaining polar bear on earth - all so some hipster can save a few bucks from buying studded tires so they can buy more of that cool Pabst Blue Ribbon bear in a can while the rest of us are biking on studded tires and 'just don't get them' - sheesh, hipsters, what's up with that? ;) Do you leave them on all winter long, even if the snow melts away before the next snowfall? OR... you could spend more for pricey BUT reusable studded tires. OR, move you and the band to San Diego already! OR... maybe there's a new invention lurking here somewhere? All I'm saying is "plastic bad... reusable good!" 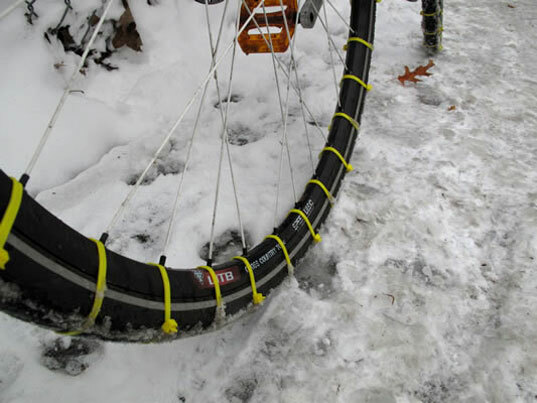 Simple zip ties are all you need to transform your bike tires into snow tires! Just zip the ties onto your existing tires and trim off excess plastic. The zips will provide much-needed traction and will keep you from sliding around in the snow.